Following on from part one, there are a number of strengths that betting exchanges have to offer punters. 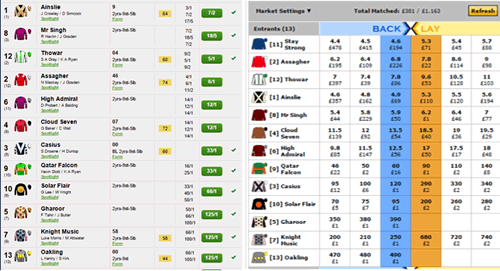 None more so than the option to lay, of which there are strategies punters may wish to use (discussed further down). As you’ve probably seen in various different adverts or promotions, one particular strength, or rather marketed strength of exchanges is that the constantly offer “much better odds” and in many cases this is true. However, it isn’t fair to say this sort of statement is true 100% of time. In the instance of horse racing for the purpose of this article, in actual fact on the exchange, the odds of the runners at the head of the market are very similar to the odds offered by bookmakers. In actual fact when it comes to favourites and short priced runners, traditional bookmakers will probably offer the better price just as often as the exchange does. Where the exchange can offer an invaluable advantage to punters is at the other end of the scale. In the majority of horse races, it is commonplace to see bookmakers offering 33/1 about a selection that is priced at 80/1 on the exchange. Similarly a 50/1 shot with bookmakers, priced at odds of 100 or maybe even 150/1 on the exchange. When using an exchange, the runners at the lower end of the market, e.g. the lesser fancied horses and the rank outsiders can almost always be found at substantially larger odds than those offered by bookmakers. The reason for this is that the odds on the exchanges are much more likely to represent the real chances of the selection winning, whereas bookmakers will not want to go out anywhere near as much in order to maximise and protect their profits. As we can see from the above illustrations, the runners at the head of the market (first 3-4) while not exactly the same, the prices are similar. However, look further down and we begin to notice the discrepancies. For example, if we look at the horse called Casius we can see him priced up at 33/1 with the bookmaker; whereas on the exchange the horse is available at more than four times the price (119/1). The reason behind such differences in price is simple. Bookmakers effectively make money by balancing their books in a way which, theoretically allows them to make money irrespective of the result. Whereas the operation of a betting exchange differs considerably. Profits are generated from commission payments, and as a result, do not rely on overrounds. Not relying on overrounds allows exchange odds to represent a much fairer representation of each runner’s real chance. Although the ability to lay bets is perhaps the biggest lure of betting exchanges such as Betfair or WBX, it is unwise to approach laying without some sort of structure in mind, a solid foundation that forms the basis for the punters laying activities. One popular notion is that of laying “false” favourites. This is where layers set out to identify those favourites that appear over bet and thus represent poor value. In simple terms: favourites that shouldn’t be favourites. For every single horse race which takes place, there is a favourite. Rightly or wrongly, one particular horse (occasionally joint favourites) will be sent be off as the market leader. In theory, this is supposed to be the horse with the greatest chance of winning the race. However, statistically, roughly two out of three favourites lose. False favouritism is often the reason behind a market leader who failed to justify their position at the head of the betting odds. It is important to note that – not just with laying but with betting on horses in general - anything obvious should be discarded. The obvious information is unlikely to help the punter make money. With this in mind, by their very definition, favourites are obvious. It is also vital to understand that simply laying favourites isn’t enough, nor is it advised as a sound practice. The aim should be to identify those favourites which are false or over bet. False favourites occur fairly frequently, yet they are all so often missed. Again this is because people concern themselves with the obvious, that which is hyped up by the media or pundits. It is with this that punters are very quick to latch onto a horse which won its last race. The conclusion often seems to be made that based on a winning run last time out it must be a good bet today. Making these type of assumptions are not only foolish but are a shortcut to punting failure. The obvious form surrounding horses which won last time out, often forgets to detail a whole manner of things. For example; the horses’ win last time may have come under circumstances which simply will not be replicated today. If we look at the performance patterns of each horse (e.g. some horses will only win after a lay off or only win at certain intervals, some will only win at tight tracks having dictated the pace throughout and so on), we can often come to both reasonable and logical conclusions as to whether the horse will run well or not. Disregarding improving youngsters and focussing on the more experienced animals (handicapper runners), more often than not, if the horse who is favourite won last time out, then that was the time to have backed it. It is rarely wise to jump on now, hoping that it follows up, because in the long run such bets are bad value. It is when we find these bad value favourites who - after delving thoroughly through all the necessary form – are established as being poor value, we can use the exchanges such as World Bet Exchange to lay them and exploit the poor decision of the majority to back the horse into a much shorter price than it really should be. WBX offers betting on every daily UK, Ireland and South African horse racing win and place market, and new members get up to £25/€25 in free bets when they join the exchange.